Take a trip on a boat floating down your inner Ganges… This album enters your senses with rich images of the East – from meditative compositions to rhythmical and energetic pieces – all masterfully played on instruments like sitar, santoor, bamboo flute, soprano sax, tabla. 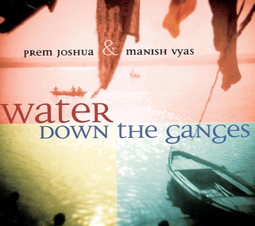 Prem Joshua & Manish Vyas, both extraordinary multi- instrumentalists, composers and musical partners for 15 years – have been recording and giving concerts together all over the world. This is their feature album under both their names – an inspired collection of compositions played with high craftsmanship – melting the traditional musical boundaries of East and West. When Prem Joshua and Manish Vyas first met in India in 1987, they immediately realized that they shared the same musical vision: a vision of a sound both energetic and meditative – a vision rooted in the musical traditions of both the East and the West. A lot of water has gone down the Ganges since that first meeting! Again and again Joshua and Manish have shared their similar tastes through projects involving other musicians as well – different solo projects, albums, and bands. In 2002 they felt it was high time they celebrated that partnership with an album composed and recorded together. The timing has been perfect. The album has almost effortlessly created itself! These compositions are all based on inspirations from their performances in India, Europe and the US. When the full moon shines over mighty Ganga on a clear night – it is like time has come to a halt. It seems like a thousand stars shine in the quiet waters and musicians and dancers perform special songs and dances dedicated to the full moon. It is reported that on such an occasion a great raja was listening to the music of his court musicians and dancers, totally emersed and captivated by their play and the beauty of the night. At this moment he was interrupted by a courier announcing that an enemy king with his army had approached the walls of the city to take over the kingdom. The raja told his courier to inform the foreign king that he can have the kingdom, they could settle such mondane things the next morning. The foreign king was even invited to join the magical and peaceful night of music and silence. The legend continues that the foreign king, originally being prepared for war, was so puzzled by the raja´s answer that he couldn´t resist his curiosity. He followed the invitation and quietly joined the concert. When he saw the raja and his court meditating to the celestial music he was so moved and humbled by the beauty of the scene that he apologized to the raja and withdrew with his army.